Portable Tags. Now you can carry around a stick full of tagged items (Labels, Tags, Comments) together with the application (XYplorer) that displays them. Regardless of the drive letter assigned by the host system. Another milestone in portability technology. Tick "Enable portable tags" in Configuration | Tags. 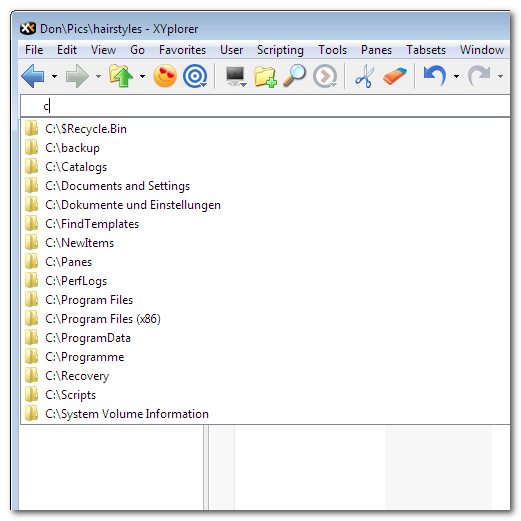 Have a copy of XYplorer.exe on your USB-stick and run it. Now do your tagging of files on this same stick. Then save the tags: They are saved to tag.dat on the stick in a portable way. 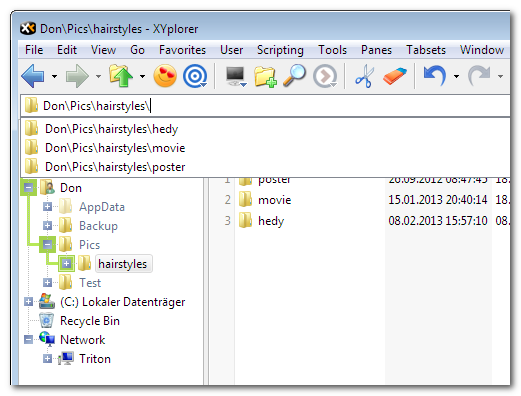 Now you can carry around a stick full of tagged items together with the application (XYplorer) that displays them. Regardless of the drive letter assigned by the host system. Here is a simple example, a button (in the screenshots: the smiley with eyes like hearts) that works like a railway switch. 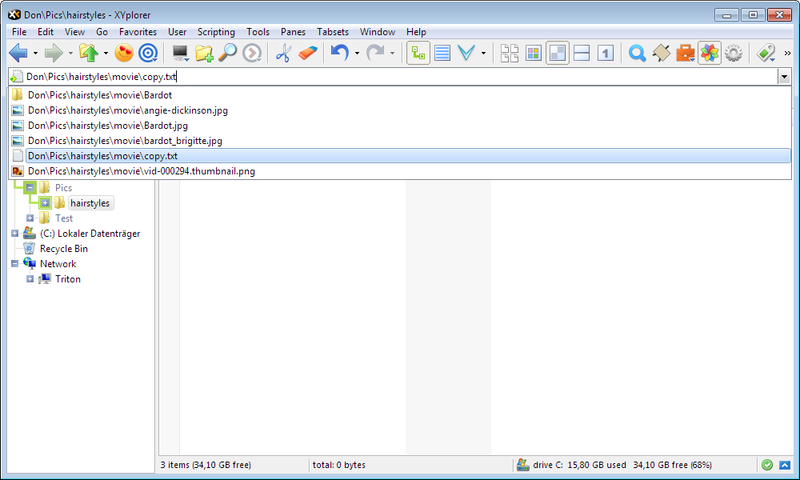 JPEG files dropped on this button are copied to folder "Country", all other files are copied to folder "Western". 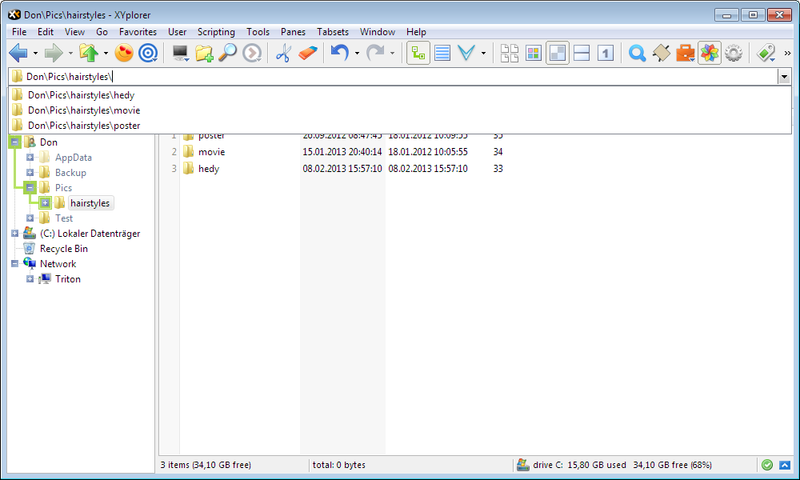 Note that these target folders don't have to been open or visible in XYplorer, and that you can drag files even from other applications onto this button. Accessibility. Full support for high contrast color schemes. Multilingual Support. Added support for Chinese (Traditional), Croatian, Russian, and Spanish. Safety. Now XYplorer protects you from the so-called "Unitrix Exploit" where certain Unicode characters are used maliciously to disguise executables. 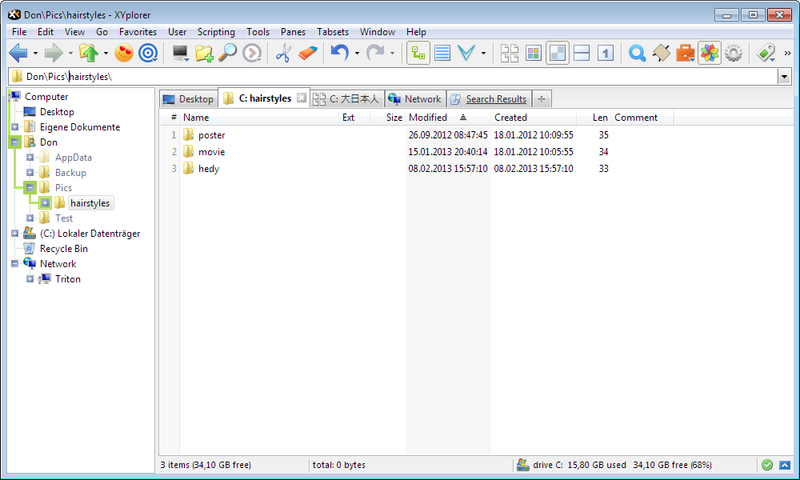 To date, no other Windows file manager offers this protection. For example, U+202E (Right-to-Left Override): If you insert U+202E at the 2nd position of the file Htxt.exe it will be shown as Hexe.txt (in *every* Unicode-compliant software), an apparently harmless TXT file which in reality is a potentially dangerous executable. 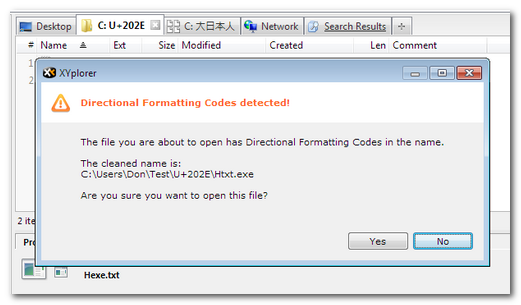 When you double-click this "TXT" file the executable will be run. 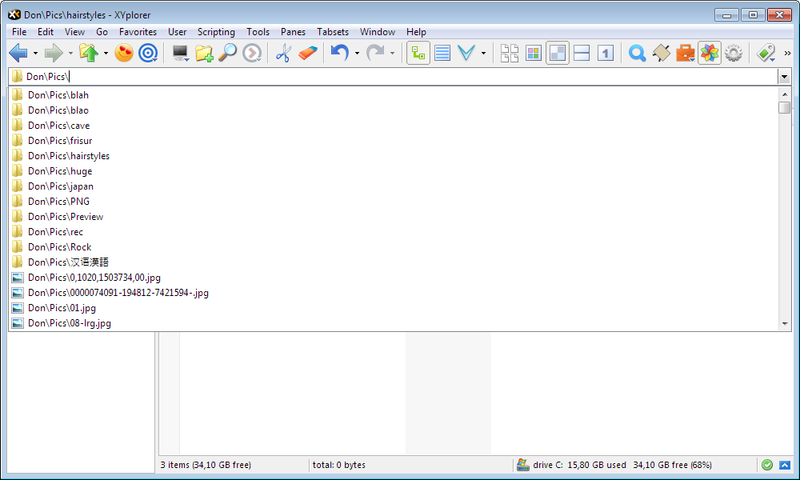 XYplorer is the only file manager to date that can protect you from this exploit. If you tick Directional formatting codes protection (in Configuration | Menus, Mouse, Safety | Safety Belts) then Hexe.txt is shown as H*! *txt.exe, i.e. the U+202E character is not resolved but replaced by *! *, and the file is clearly recognizable as executable. In the File List: each DFC in all filenames is replaced by *!*. In the Status Bar: each DFC in the current filename is replaced by *!*. NOTE: Because DFCs can make the Status Bar unreadable you get this replacement independently of the setting of "Directional formatting codes protection". When opening a file containing any DFC, you are warned. NOTE: Because this is the most dangerous part, this warning cannot be turned off! 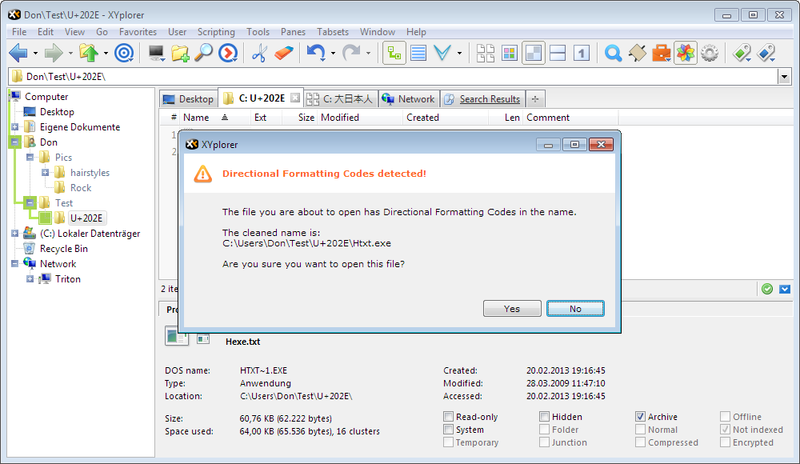 You get it independently of the setting of "Directional formatting codes protection". 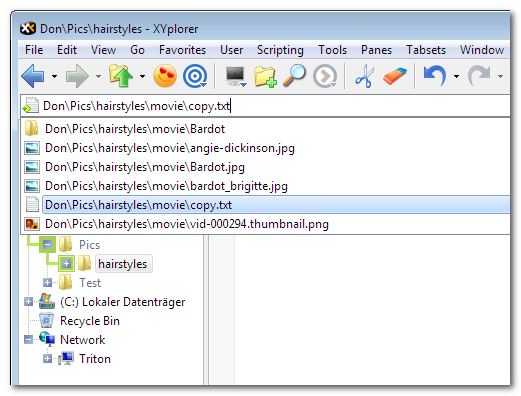 XYplorer allows you to search for files with such characters in the name. You can paste them into the Name field (you won't see them but they are there). The "Convert to ASCII" command in Rename Special is a quick way to remove such characters from a filename (but, of course, it will remove ALL Unicode characters). 6 Key Navigation. Now you can browse the whole computer by just 6 keys (Ctrl, Left, Right, Up, Down, Enter) in the Address Bar. 6 Key Navigation: It's possible even one-handedly. Left:       Move caret to left. Right:      On right end (if folder): Append backslash (opens match list). Else: Move caret to right. Ctrl+Left:  Move caret to parent folder component. Ctrl+Right: Move caret to child folder component. Ctrl+Down:  Open/Update match list at caret position. Enter:      Go to item or open file (if "Open files from Address Bar" is ON). Close match list if it is open. 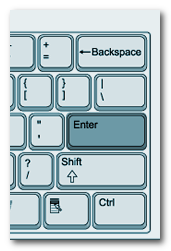 Ctrl+Enter: Like Enter, but Goto/Open inverted. Up:         Move up in match list (to last item if none selected). Down:       Move down in match list (to first item if none selected). Ctrl+Up:    Close match list (no action). You can open a match list at the caret position. Move the caret at to some position in the edit field of the Address Bar. Now Ctrl+Down will open the match list for the part left of the caret and trim the part right of the caret. You now can live-filter the match list by pressing letters or select an item from it using the Down and Up keys. When the match list is already open, you can renew its contents (= browse another folder/pattern) without first closing it. Simply move the caret to another position, press Ctrl+Down again, and the open list will update its contents. Slick! In the dropdown list select a folder by Down / Up, then press Right to append a backslash to go down to the next level (i.e. browse this folder). Note: To enable 6KN Configuration | Controls and More | Auto-Complete Path Names | Address Bar has to be ticked, and Filter should be set to "Files and Folders" or "Folders only". Address Bar. Now the dropdown list optionally shows all matching files (not just folders) and you can open them right from there. In Configuration | Controls and More | Auto-Complete Path Names you now have a dropdown Filter where can choose whether the Auto-Complete match list should contain "Folders Only", "Files Only", or "Files and Folders". 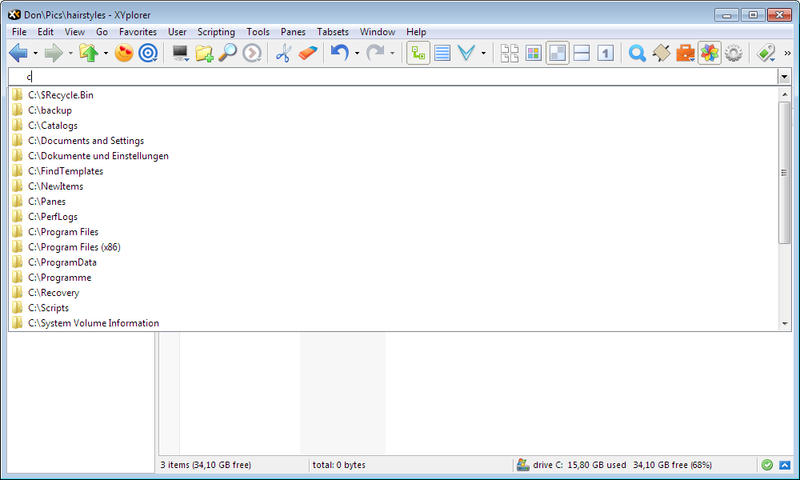 XYplorer 12.20.0200 has been released on 26-Feb-2013. It just has some bug fixes. 4 Key Navigation. 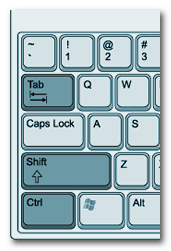 Now you can browse the whole computer by just 4 keys (Ctrl, Shift, Tab, Enter) in the Address Bar. 4 Key Navigation. The power user's approach to the file system. Ctrl+Tab:       Open match list at caret position. Ctrl+Shift+Tab: Open match list to parent of current Address Bar item. Tab:        Move down in match list (to first item if none selected). Shift+Tab:  Move up in match list (to last item if none selected). Ctrl+Tab:   Update match list to current list item. If no list item selected: close match list. Ctrl+Shift+Tab: Update match list to parent of current list item. Note: To enable 4KN Configuration | Controls and More | Auto-Complete Path Names | Address Bar has to be ticked, and Filter should be set to "Files and Folders" or "Folders only". 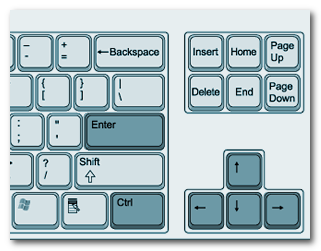 Mouse Click Navigation. Now you can browse the whole computer by just using the Left and Right mouse button in the Address Bar. Left Click on icon: Open match list at caret position. Left Click on Address Bar icon: Close match list (no action). Left Click on file: Perform the default action for that file (open or go to). Left Click on folder icon: Browse that folder (right in the dropdown!). Left Click on folder name: Go to that folder. 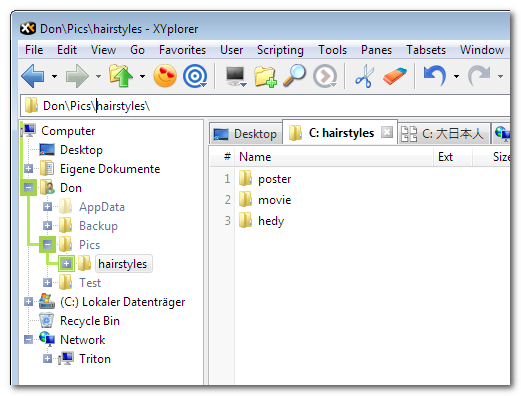 Right Click on file: Pop a context menu that lets you open or go to the file. in the dropdown! )or go to the folder. For the mousy man this is probably the slickest access to the file system ever designed. 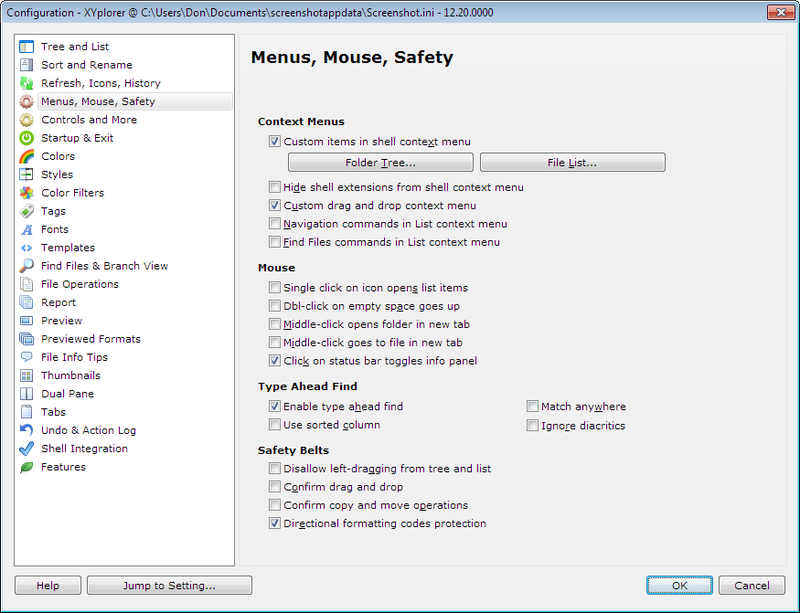 Note: To enable Mouse Click Navigation Configuration | Controls and More | Auto-Complete Path Names | Address Bar has to be ticked, and Filter should be set to "Files and Folders" or "Folders only". Address Bar. Now Ctrl+Click on the edit box icon will open the match list to the parent of the current item. Auto-Complete. Minor enhancements and refinements.